Posted in: Books. Tagged: children. As a way to spur myself to read more, I’ve decided to start writing short blog posts about books once I’ve finished them. This will also help me keep track of what I read (I usually forget within a few weeks). Just yesterday, I finished another book (next up: Goodwin‘s The Bully Pulpit! ), and here are my thoughts, FWTW. 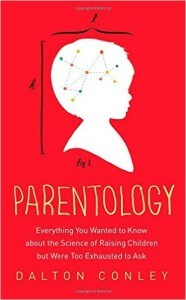 Since my daughter was born a few years ago, I’ve tried to educate myself a bit on the science of parenting and have encountered several books on the subject. Unfortunately, a lot of them are filled with platitudes and anecdotes, not a lot of hard science. However, at some point last year, I came across Dalton Conley‘s Parentology. It’s definitely not a parenting-how-to book, but it’s full of scientifically informed insight and humor about the author’s personal experience raising his children. Conley draws on the latest sociological, genetic, and economic research, as well as his own scientific work, to paint a picture of the current understanding of child development and the role parents play. Although Conley sometimes discusses elements of his own life story that aren’t directly relevant to the narrative, mostly his personal experiences serve to color and illustrate the research discussed. As a professional scientist myself, his fearless approach to parenting really resonated with me, and I especially appreciated that he didn’t fill his book with fluff.